We fly anywhere in the world, anywhere in the United States, any time we're needed. Thirty years experience, thousands of medical life flights completed successfully. Thousands of life flights with NO loss of life and NO air mishaps - 100% success. The highest safety record in the business! A.C.L.S. Certified Aircraft & Crews with RN, stretcher & all medical equipment. When we fly a patient, life flight transportation is our only business - no charter or cargo. If you or your loved ones need reliable, safe, prompt, professional life flight transfer or you have questions, please phone us anytime. 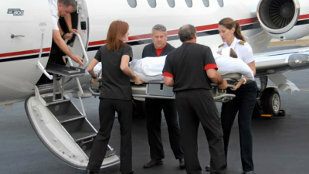 We will offer you the highest quality in the life flight industry. Use our Secure Online Form to make reservations, ask questions, or contact us. You can also get your questions answered and receive prompt, reliable service by calling us anytime, day or night. When you call, let us know you found us on the Web! Copyright © 2001 - 2010 ACLS Pegasus, LLC. All rights reserved.